Porsche is extending its line-up of compact SUVs by adding the new Macan entry-level model. Furthermore, the Cayenne will now be equipped with the latest generation of Porsche Communication Management (PCM). 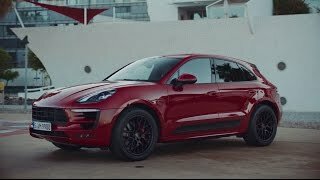 The turbocharged two-liter engine in the Macan delivers 185 kW (252 hp; Combined fuel consumption 7.4–7.2 l/100 km; CO2 emissions: 172–167 g/km) from 5.000 to 6.800 rpm and comes standard with a seven-speed PDK dual-clutch transmission like all Macans. 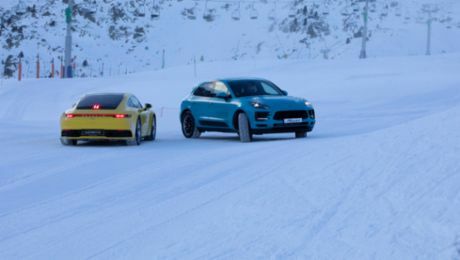 As a result, the Macan delivers impressive acceleration: It is capable of reaching 100 km/h in 6.7 seconds, and with the optional Sport Chrono-Package, the time is reduced to 6.5 seconds. The top speed is 229 km/h. In terms of fuel consumption, the Macan proves to be very efficient: Depending on the mounted wheel and tire combination, the Macan consumes 7.4 l/100 km to 7.2 l/100 km according to the NEDC. The in-line four-cylinder engine is designed to be particularly sporty and efficient: It operates with up to two bar of boost pressure, charge-air cooling, petrol direct injection and variable valve timing. VarioCam Plus adapts the intake and exhaust camshaft continually and also controls the lift of the exhaust valves. Its powerful 370 Nm of torque available between 1.600 rpm and 4.500 rpm, for instance, enables fast overtaking maneuvers. As is characteristic for all Porsche models, the Macan is capable of converting its engine power into exceptionally sporty driving dynamics. This is ensured by the standard Porsche Traction Management PTM active all-wheel drive system in interplay with an agile suspension and precise steering. An air suspension system with levelling control including the PASM with adaptive dampers is available as an option. With an unladen weight of 1.770 kilograms, the Macan is the lightest SUV made by Porsche, which translates into agile handling. Visually, and in its features, the new entry-level model only differs from other more powerful models in its details. Exterior distinguishing characteristics are side window trim strips in black, also black brake callipers in back of the 18-inch wheels and an exhaust system with two single tailpipes made of brushed stainless steel. Many of the vehicle’s standard features are the same as those in the S models. 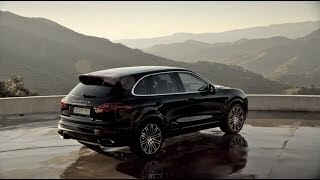 For example, the Macan has comfort seats with electric eight-way adjustment on the driver’s side, Alcantara middle seat panels, the latest generation of Porsche Communication Management (PCM), a lane-departure warning system and a powered tailgate. The centrepiece of the new future Porsche Communication Management system (PCM) that will be standard in all Cayenne models is a high-resolution seven-inch touchscreen. The redesigned user interface enables operation that is intuitive and smartphone-like. When the proximity sensor detects a user input, relevant menu contents are shown, which the driver can control by multi-touch gestures. Bluetooth, USB and SD card interfaces make it possible to integrate smartphones and memory media. Also new is the option of connecting an iPhone via the PCM to use Apple CarPlay®. The new navigation module is included in the Cayenne as standard. It impresses with high-resolution map display and, for the first time, 3D representation in some regions. Navigation can also be conveniently started by voice control. The optional Connect Plus module improves dynamic navigation considerably by the use of real-time traffic information. The online services Google Street View® and Google Earth® can be used for precise visualisation of details along routes and in built-up areas. The use of PCM as a Wi-Fi hotspot and even more extensive integration of smartphones leave no wishes unfulfilled in terms of connectivity. Also new is the Porsche Connect app. For one, it lets users transfer destinations to the PCM directly from a smartphone to start navigation. The familiar Porsche Car Connect app is also included in the Connect Plus module. This app lets users control certain vehicle functions remotely from a smartphone and access data such as the car’s fuel level. The new generation of PCM was first introduced in the new 911 (991 II) and is a standard feature in all 911 models. In addition to the Carrera models, the Targa models and the top-of-the-line 911 Turbo variants are equipped with the new infotainment system. The new module is also standard in the new model year of Macan. The new 718 model line will use the new infotainment system as well. Depending on the vehicle model, the new PCM comes with a varying level of standard feature and optional packages. The new Cayenne combines three chassis concepts in one new design: sports car, off-roader and touring car.